While visiting the skiers ‘paradise Courchevel, you will be deliciously charmed to savor some of the world’s finest and scrumptious cuisines. To your surprise, it tends to be unerringly consistent and you’ll find yourself served graciously mouth-watering meals at every turn. Courchevel has enjoyed a proud profile for serving delectable food with grand culinary delights made by some of the best chefs ever to don an apron. Since guests are confined to short holiday times, the focus should always stay on sampling what Courchevel has best to offer. The general rule of thumb is that the higher the elevation, the pricier and exclusive Michelin star hallmark restaurants set anchor. The value of having a delectable and fine dining experience in Courchevel in 1850 can extend to eye-popping amounts. On the other side, exclusive high-priced restaurants and lounges are the magnets for elite groups willing to pay big bucks towards creating momentum with social groups they are accustomed to. Dining out in Courchevel is surely a treat for your taste buds. The deluxe restaurants are open all day long for you to relish on a casual or an extravagant meal. Coffee shops serving warm drinks and snacks along the ski resorts pair harmoniously with the culinary venues. The picturesque views from these locations are outstanding as either the focus is on the city center district where luxury shops line up or, they are nestled at the top of the gondola for the ideal viewpoint. These restaurants are fully committed all through their opening hours and it is always recommended to make a reservation a soon as you map out your vacation itinerary. Are you planning on hosting a birthday party, a milestone celebration, or taking your beloved one on a romantic candlelight dinner? Not to worry, Courchevel will meet all your needs and cater to beyond your expectations. No matter what the occasion is, you’ll find a restaurant that has your choice of cuisine, ready to add the surprise element to the unique dining experience. If you are looking for a night out with someone special, Courchevel offers an array of venues with a unique style, trendy design whilst maintaining the traditional alpine style guests look forward to. You’ll want to dress up and look your best, as the dress code is “dress to impress” and be ready to be photographed with the known and the famous. Live shows while being served artistically plated dishes surrounded by heart throbbing beats is the culture during the season. Azimut, the perfect lunch spot in Courchevel Le Praz (1300) opens its doors daily throughout the season. Designed to combine a modern and alpine style, this restaurant is set to constantly forge the warm and cozy setting Azimut guests rave about. Among the top fine dining label group in Courchevel, Chef Francois Moureaux led the way with his Michelin starred gourmet restaurant using fresh and seasonal local ingredients, to create simple and delightful exceptional plates. The restaurant has a romantic feel and the perfect setting for a unique dream date. 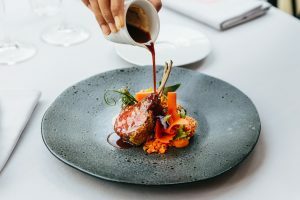 A tasting menu is offered exclusively to guests allowing them to personally indulge in chef’s private time, as he performs live his well-selected courses. The menu is French European based cuisine served in the finest crockery. A complex yet fascinating wine list is presented by an expert sommelier for those who want to pair their meals with the perfectly blended French wine. Azimut restaurant welcomes all ages and is family friendly. Le Chabichou, a true landmark restaurant opened its doors 50 years ago and acquired its merited 2 Michelin-starred status for its renowned upscale gastronomy and hospitality. 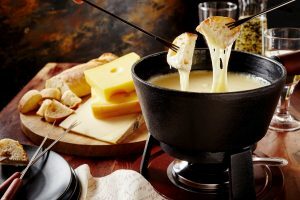 Le Chabichou located in Chenus area of Courchevel 1850, is a family restaurant with a blend of classic design and a mishmash of customary style and traditional Savoyard. The outdoor seating area welcomes guests with views of the mountain and the city center, whilst savoring on gourmet meals and signature cocktails. The menu is refreshed monthly with local and seasonal ingredients, keeping guests excited to discover new creative and refined plates. The restaurant is open daily for lunch and dinner, however, closed every Tuesday starting Jan 8th. The July summer package offering a luxury stay at the hotel, paired with spa treatments, then followed by a Michelin culinary experience is surely an opportunity not to miss. Le Farcon restaurant in La Tania, Courchevel is a highly rated venue where fantastic flavors have been praised by visitors. The restaurant opens conveniently its doors for lunch, dinner, late night drinks and after hours’ snacks. The menu is of French European focus mastered by Chef Julien Machet who has added a “surprise” carte du jour to the delight of foodies wanting to experience a unique culinary affair. The menu selection of Le Farcon has progressively changed and improved year after year to craft an exclusive display never fails to amaze. An incredible 7-course gastronomic dinner including lobster, arctic char, seasonal fresh vegetables, and a succulent dessert leaves your taste bud tingling with an unrevealed pleasure. The Le Farcon’s wine cellar is an enchanted “Ali Baba’s cave” stretched from Bordeaux regions to Cote du Rhône having both sweet and dry options complimenting the flavors created by the chef. Le Petit Savoyard in Courchevel Moriond (1650), is amongst the highest rated French European restaurants offering varieties of Savoyard specialties, pizzas, along with a delicious vegetarian menu. The restaurant opens daily for lunch, dinner and late-night drinks. The daily menu offers a variety of great food, including traditional French cuisine, fondues, burgers, and steaks. They are well known for their large pizza menu selection ideally catered for a night in with friends and family. The restaurant welcomes large and small groups of all ages and without a doubt, the prime location for the little ones to enjoy their favorite meals. Le Petit Savoyard has a very cozy chalet feel, with big pine beams on the walls and around the bar giving the place a touch of home atmosphere. Le Bouc Blanc is a renowned and traditional mountain restaurant located at the top of the La Tania Courchevel gondola. It has an expansive 400 seat patio dominating stunning views of the slopes. The menu is an authentic French cuisine featuring beef Bourguignon, duck confit, authentic regional cheeses, lamb chops, eggs and evidently, a large side of everyone’s favorite: French fries. The tasteful, delicious and copious meals are available for takeout or for immediate enjoyment. Devoted skiers are usually enthralled and fascinated more by the slopes of Courchevel that they do with a break for a proper meal. The service at Le Bouc Blanc is highly rated and much appreciated, especially for their swiftness, welcoming approach and reasonable prices during a busy lunchtime. This entices the dyed-in-the-wool skiers to take a break and surrender to an effortless decision to just to be and enjoy this top of the mountain community. L’Arbé is a family friendly restaurant welcoming every season large group and get-togethers. Located in the center of Courchevel 1850, this traditional Savoyard venue takes pride in serving native specialties & homemade pastries for lunch and dinner. The menu is renowned for its half a dozen fondue options, delicious burgers, tapas to share, vegetarian and gluten-free dinner and much more. The plated dishes have generous servings and priced reasonably especially with such top quality. 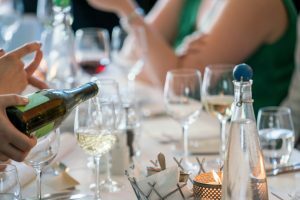 Carefully selected wine, varying from Savoy region, Côtes du Rhones, Val de Loire, Alsace, Bordeaux, and the delicious Provence wines are offered to complement your meal. La Boulotte is a renowned British bar & restaurant in Courchevel Moriond with lively après-ski entertainment, serving traditional pub food and the famous English breakfast. Bands play live music throughout the week for guests who are seeking simplicity for a night out with friends and family without pretenses. The dedicated owner and staff interact personally with their guests making them feel at ease and welcomed. The wonderful experience visitors will have while having a meal or a drink is one of a kind. The menu includes chicken wings, wraps, burgers and all the beer and cider you could wish for. One of the holiday specialties is a hot wine which is a red wine mulled with winter spices and raisins recommended by many. Most of the staff is English speaking authentic to the English experience whilst being in a French region. Snowfood La Pizza Gourmande is a small pizza restaurant located in Courchevel, La Tania with a lot to offer. The French are the main pizza consumers in Europe and this gem of a place has all the French covered! The restaurant offers hot and cold alcoholic beverages, a variety of sandwiches and paninis, nuggets and fries, soups, salads, and mouth-watering pizza topping. The pizza menu alone is large and has many options for toppings such as egg, tuna, honey, all gloriously laying on a homemade crispy baked dough. This layout of creation has incontestably made all the difference in taste and quality. They serve dessert crêpes and waffles varying from Banana chocolate, Nutella and grand Marnier flambé. Located at the bottom of the slopes, snow food la pizza gourmande make a quick stop to grab a bite such an easy decision. The restaurant has an adorable outdoor patio for guest to enjoy whilst viewing the scenery. The staff is friendly and always wearing a smile while welcoming their guests. No matter what your taste buds are in the mood for, you will find a restaurant in Courchevel to satiate them. You will be tempted to be contemptuous and stay in one lieu but dare to explore. All these other amazing places around the resort are dying for you to visit, socialize and mainly have a good time.